Digital project records based on enaio® offer flexibility, a high level of ability to integrate with other applications, and global data availability. They’re special in that they can be precisely tailored to respective requirements, whether these are specific to an industry, a company, or a department of a company. enaio® can be used as a platform to manage electronic data, from Office documents to photos and CAD drawings. It’s also easy to integrate structured data streams from a merchandise management or ERP system. 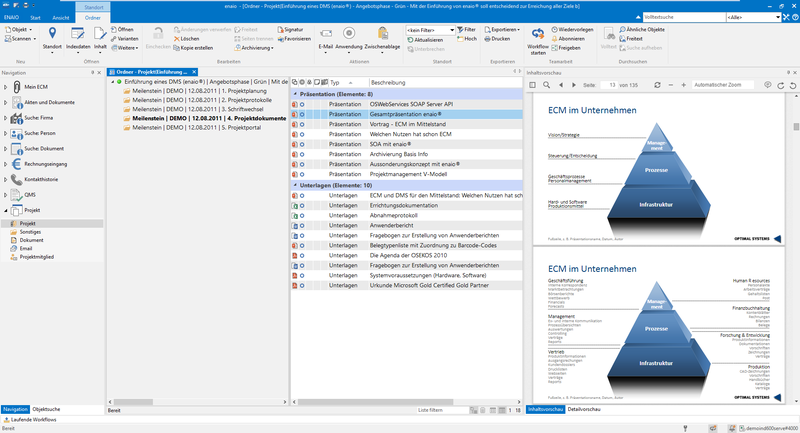 All project participants work with the same software release: enaio® puts an end to complicated version control. Centrally manage all project-specific information from a single location. enaio® helps you uphold legal requirements such as storage or deletion deadlines. Archiving solutions need to uphold statutory deadlines. enaio® supports you with this challenging task. Digital project records enable the transparent display of elements linked across multiple dimensions in a process. When necessary, they ‘share’ digital information with customer, supplier, contract, and other records. The option to access information from various perspectives and layers ensures a better overview for all project participants and improves the ability of employees to provide information. All in all, this boosts the productivity of the IT infrastructure. enaio® serves as the ‘lowest common denominator’ for project management – it’s the framework underpinning all special resource and time planning tools in use. Electronic records can fulfill all kinds of requirements and be used in all kinds of areas. Digital project records are specially designed for use in projects – especially those that involve numerous people, departments, and, if applicable, locations. Depending on the company and the application, the area of application expands – this is the case for IT management, internal project controlling, and mechanical and plant engineering, to name a few examples. Areas of application can extend to documents used in project management as well as customer and machine records, maintenance and service, made-to-order production, and beyond. There are cabinets, folders, and records – our employees are familiar with those, and recognize them here. It’s easy for them to get their bearings – even though it’s all electronic now, everything’s the same as it was before. We save 25 meters of shelving space each year – we used to have to reserve it for paper records.